Hello little blog, it’s been a while. I find that frequently I just get wrapped up in the real world, or my own mind that leaves little room for things like blogging. But never fear, I always come back. Eager to share, and eager to continue transcribing my spiritual adventures. As it’s been a while I thought it would be a nice way to ease back into things by sharing photos from my recently cleaned altar. There are to be many projects, and much blogging on the horizon. This blog will get a face lift amoungst other things. But that is another post for another time. 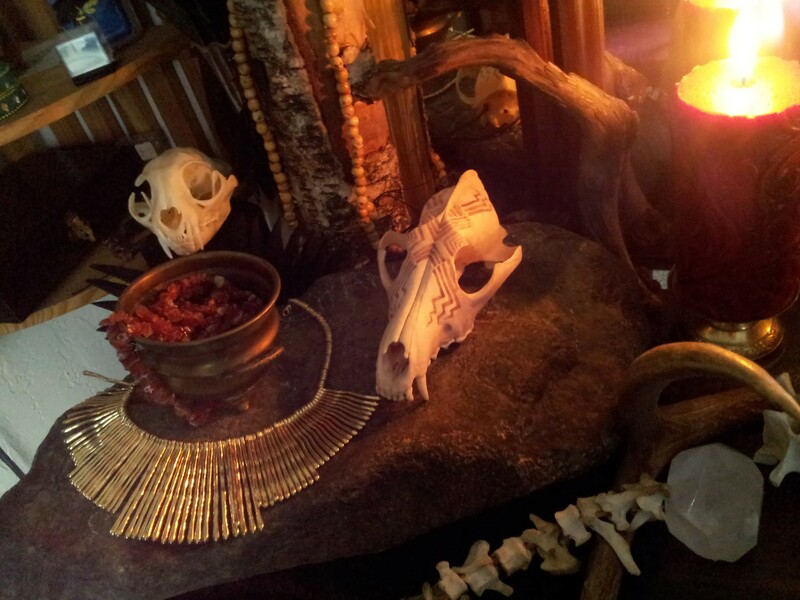 For the now I’d like to say how much I love my winter altars. They just come together so much easier. The bones, the stones, the furs, and wood. It all just sings in harmony and I love it. In spring and summer I feel the lack of color, the lack of being outside on a green hill in the open sky. But in winter, it is all stark and wonderfully homey. The bones I leave out all year round, they are spring and summer bones as well. But in winter they take center stage. Wonderful in their off white glory. Warmed to yellow in the flame. There is something about candlelight that just makes an altar connect. It’s hard to capture in photos, at least it’s hard for me but still. The illumination of the flame has always connected to me. I think of it as the light of the human soul. There is something incredibly comforting and familiar while at the same time foreign and mystical about it. Imbas in the ear that hears me. Of my beloved Gods, of the Valiant Dead, and all that came before. 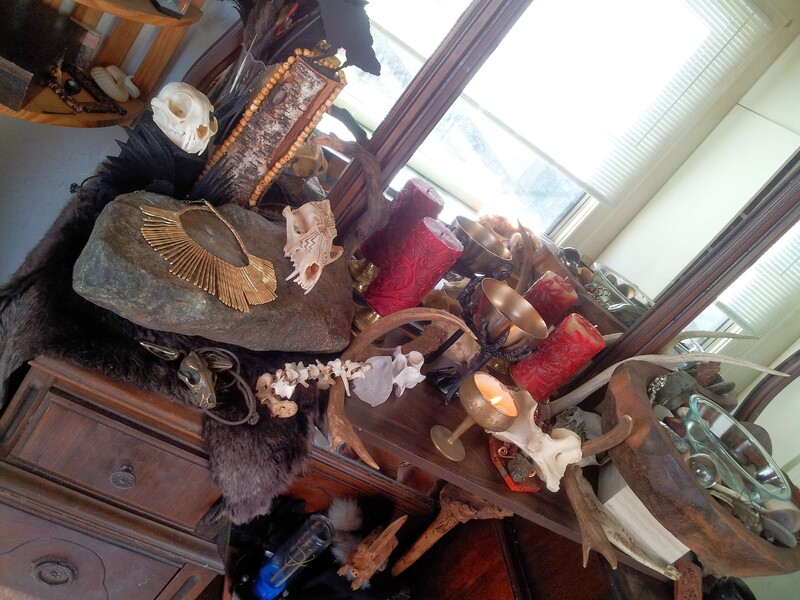 Yesterday, or yester-evening to be more precise, I decided to do the unthinkable (tho thought about often) and clean out the storage in my altar. 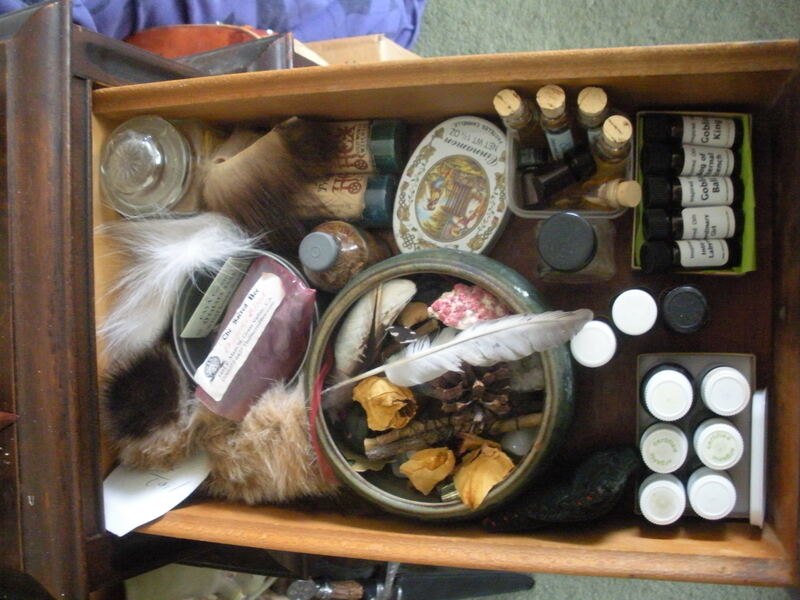 As you can see above I’m a lucky witch/pagan in that my altar comes with storage. 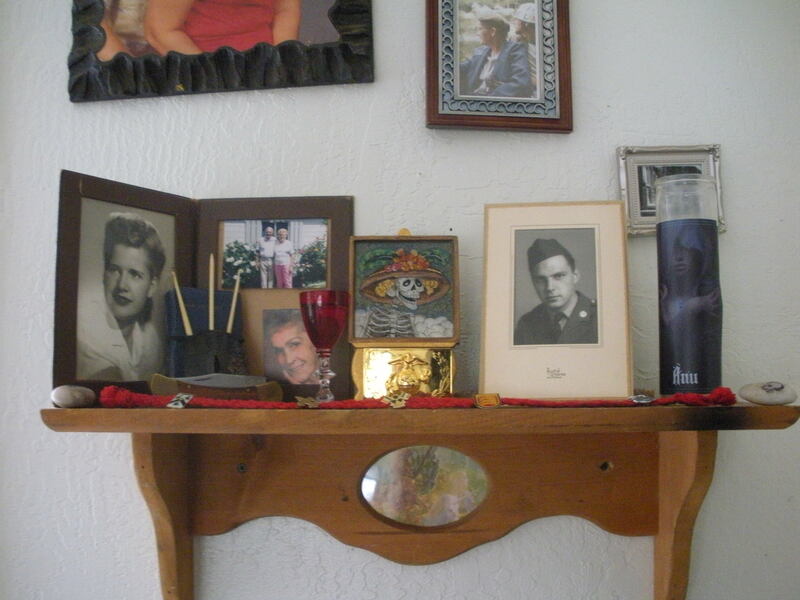 My altar was my grandmothers dressing table, a present from her sons, and something I deeply coveted my whole little life. 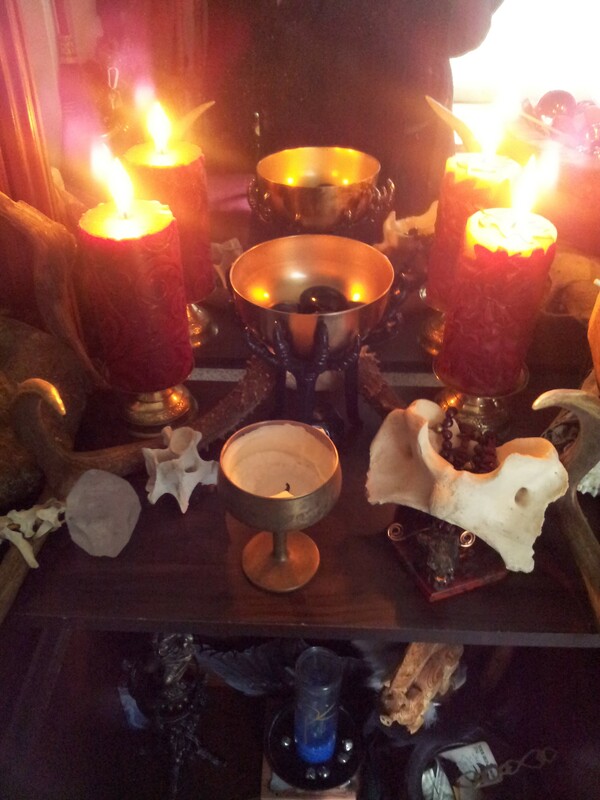 I don’t know that I ever imagined it would be an altar but holy hell does it make an awesome one. 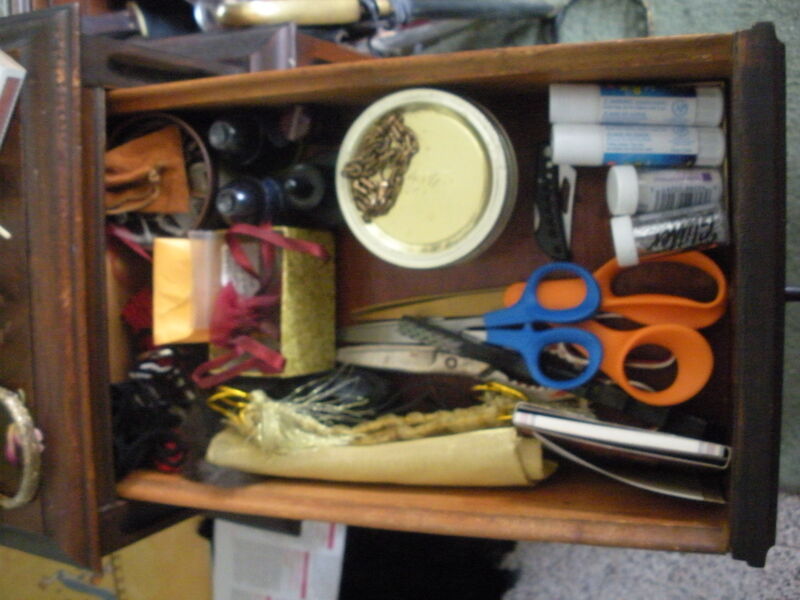 But you see I’m not the most organized girl in the world and would just throw my bits and pieces in whatever drawer it would fit and call it a day. 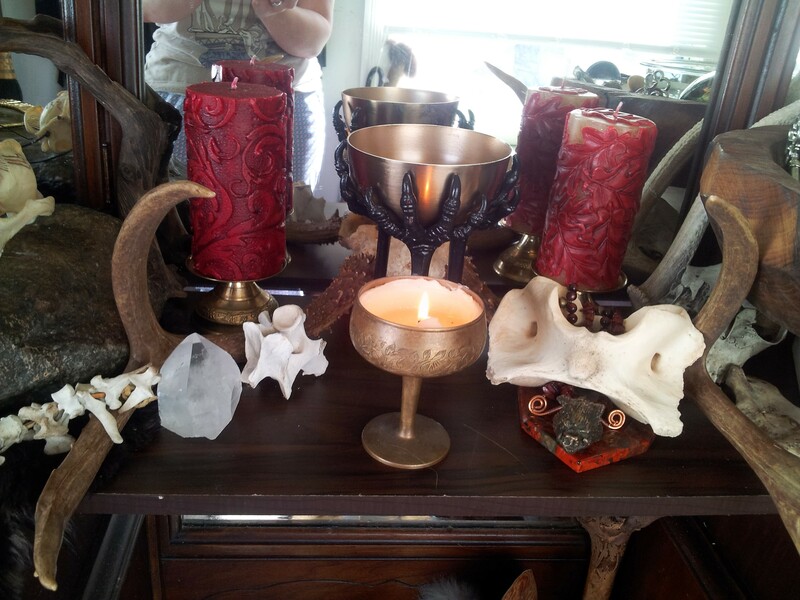 Which you know works in a way, but is well…problematic when you are CONSTANTLY being called on to bring this and that to ritual or have a very large coven that has a plethora of needs at any given moment. So the time had come to empty them out and make them nice. And I was excited! And then I was surrounded by mess and not excited. lol I don’t have a whole lot of stamina for these things and cleaning out the altar meant cleaning out the overflow storage and retrieving the items that weren’t in the altar because there was other crap in it but should be in the altar, and well you get the picture. It became an ordeal. It involved several breaks. The Lumberjack came in and shook his head in dismay, muttering something traitorous about “putting things away in the first place”. There was whining, and the realization that half my supplies are in fact still in a box in the closet(Argh!). But thru this all I preserved! The result of which is this ridiculous picture heavy post lol. Personally I like looking thru other peoples stuff thus I’m forcing you all to look thru mine. First we have the top left hand drawer. The Practical Things drawer. Here you find scissors, gluesticks, notepaper, bags, graveyard dirt, ink, indigo powder, a bowl of keys, various magic bits to tie things. 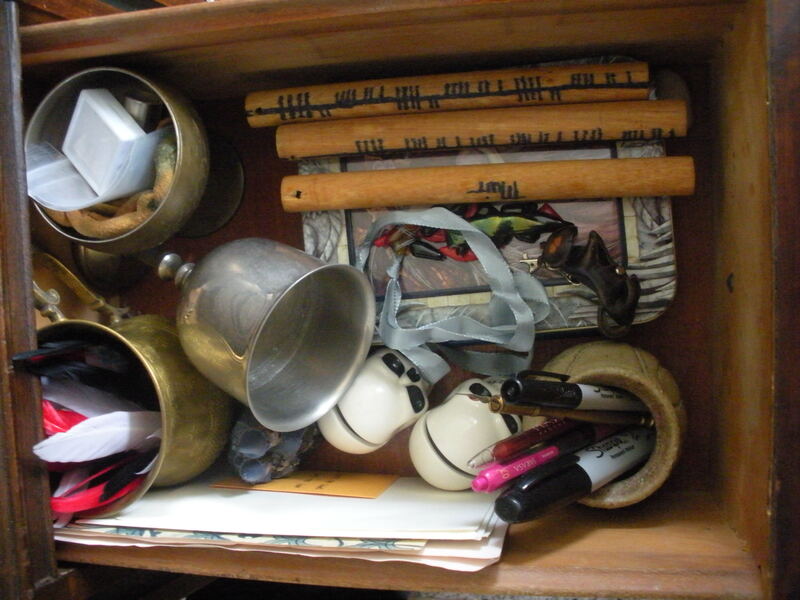 This is the second left hand drawer. I’m sure the title makes no sense to anyone but me, but this is the draw of Things to use. 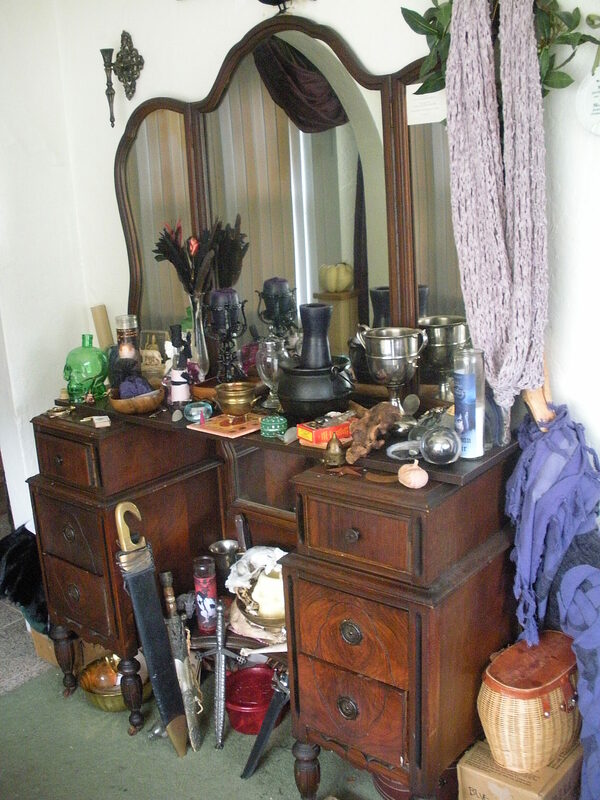 Chalices, warding staves, skull markers, pens, various magical papers, feathers, containers, charms. The bottom left drawer. 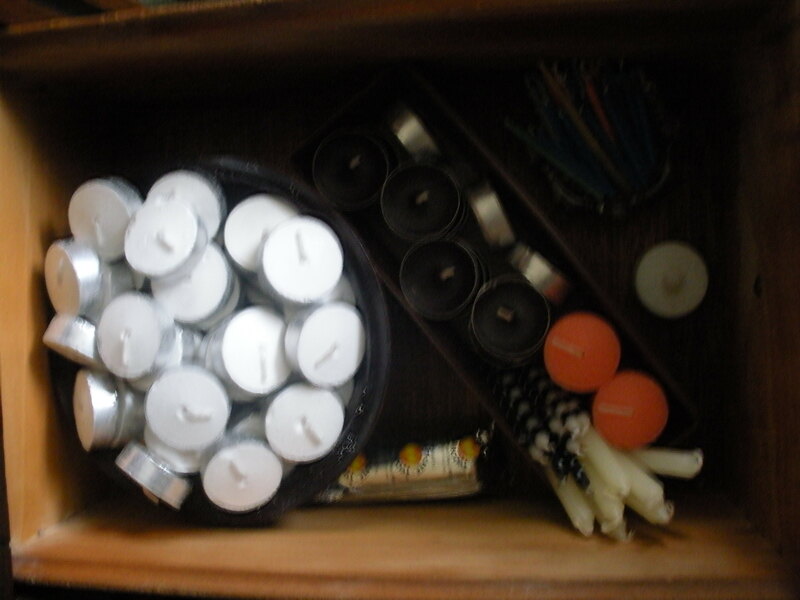 Fairly self explanatory, the Candle drawer. Not all the candles obviously, but the ones most often in need of refilling, the tea light, and little charm candles. The top right hand drawer. The Ingredient drawer. 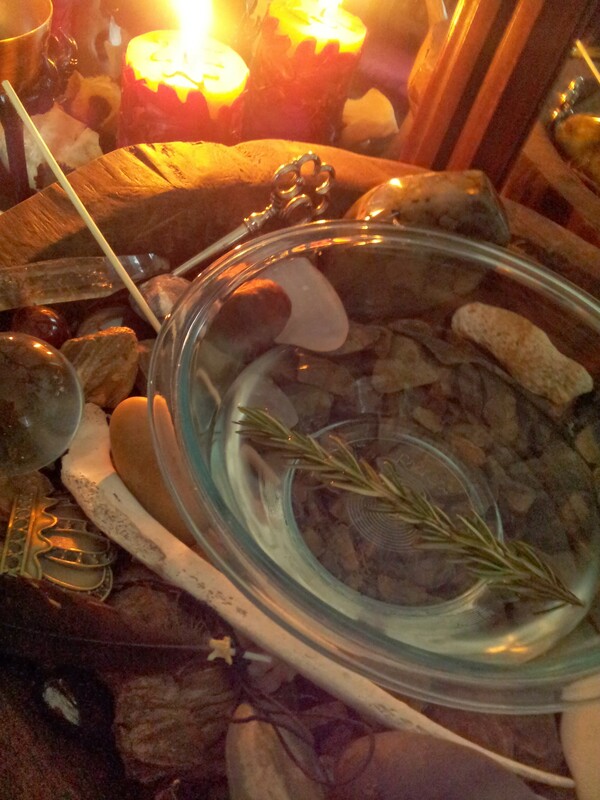 The place for the oils, the sacred waters, the bowl of various leaves/rocks/twigs/feathers/offering bits, the incense, sacred charcoal, and fur tid bits. 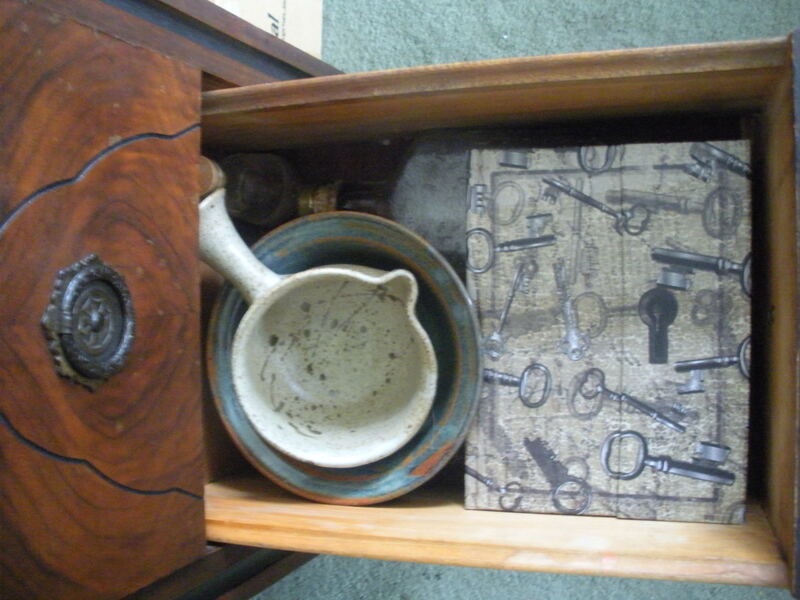 The second right hand drawer with Tools for witchcraft. My style lol. 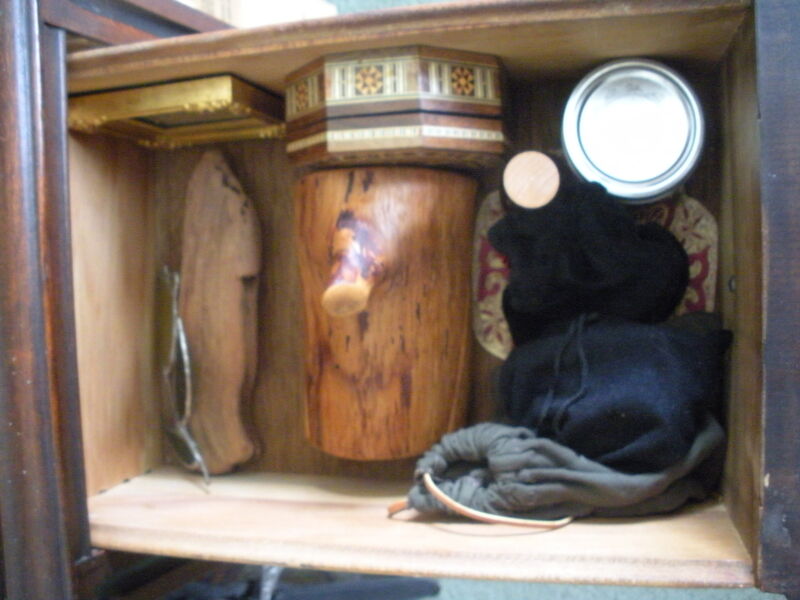 My bags of ogham staves, runes (stone, antler, & wood), the Alder limb box, another magical box, drift wood, Morrighan war paint, a lil’ mirror, a scrying mirror, and a blessing marker. Last and least the bottom right hand drawer, the odds and botkins drawer. 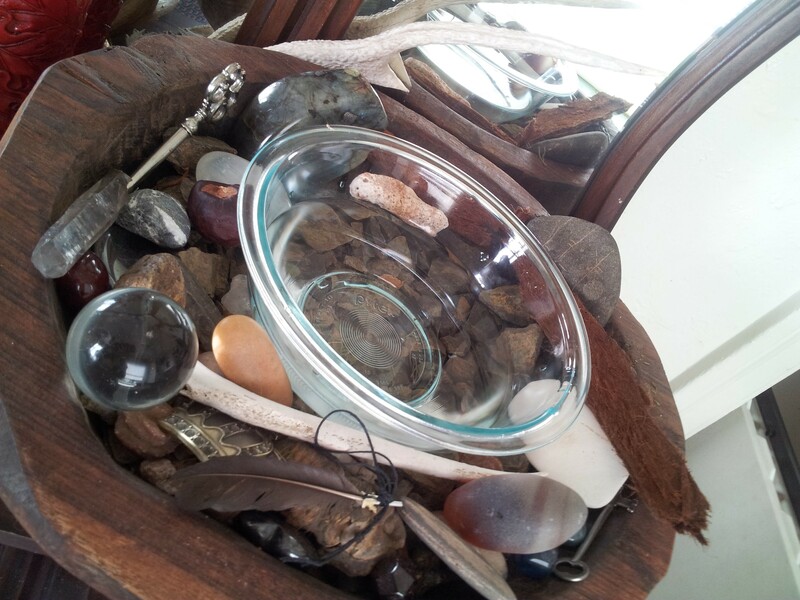 Place for bowls, a bottle of the 1st storm of 2010 water, mysterious key book. I’m glad I did it, things will be nice and easy for now. 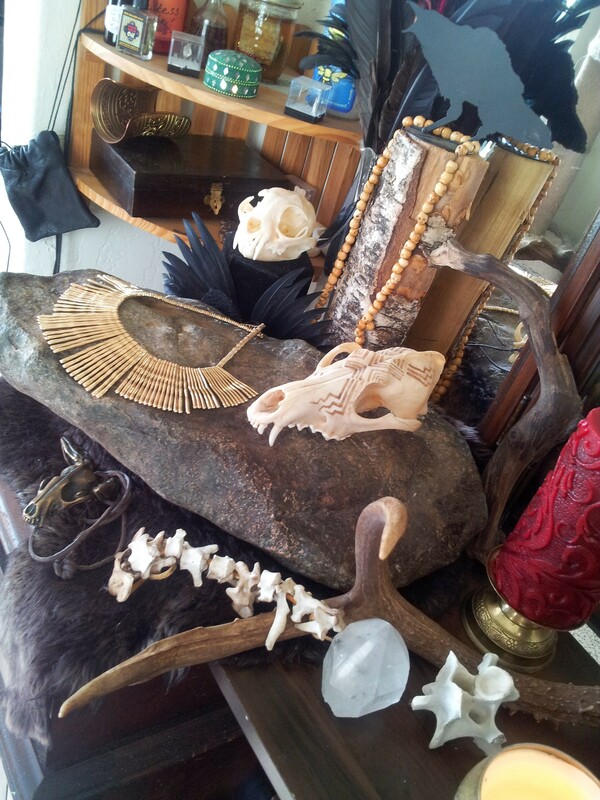 As an added bonus I also rearrange the ancestor altar. Took down the spring/summer flowers, because yesterday was also the first day that we bought harvest/halloween decor! 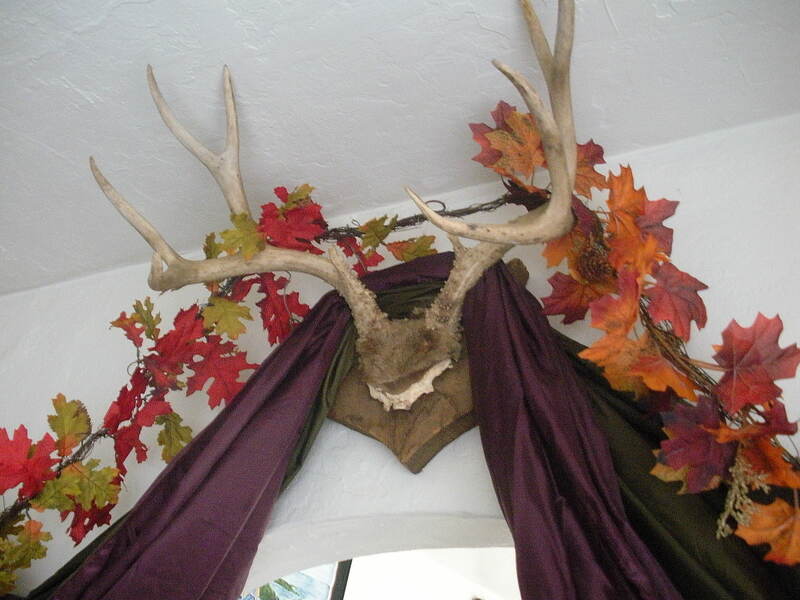 After Lughnasadh it’s very very hard for me to focus on anything except “Samhain is coming!”.